Thriller Live, the West End concert spectacular, is extending its record-breaking run to April 2020. Thriller Live is a non-stop concert featuring all of the greatest hits from a career spanning the Jackson 5 to Thriller, the world’s best-selling album with more than 105 million copies sold to date. 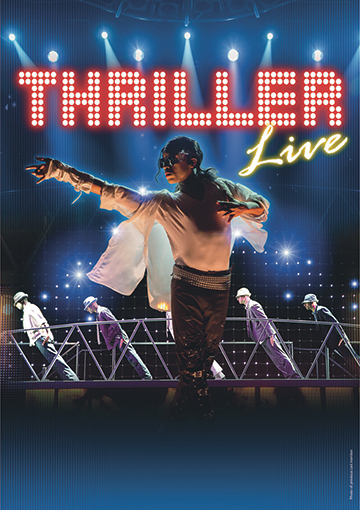 Originally scheduled from January to May 2009, Thriller Live’s run has been extended over 20 times since and it continues to draw theatre going audience and pop fans to sold out shows at the Lyric Theatre. A second production of Thriller Live continues to tour the world with dates in Kuwait, Dubai, Germany and throughout the UK. Thriller Live is unlike other West End musicals. There is no script or story, it is instead an eye-popping celebration of the Jacksons’ music legacy, bringing to life on stage distinctive high-energy dancing and the pulsating sound of many of pop’s greatest hits. The show changes each year with new numbers added, and features specially created video footage and effects and dazzling choreography by the show’s award-winning director, Gary Lloyd. Thriller Live first Moonwalked into the Lyric Theatre on Shaftesbury Avenue in 2009 and it holds the record as the longest ever run of a show since the theatre opened in December 1888.Thriller Live has now been seen by over 5 million people in 33 countries and played over 6,500 performances worldwide, never failing to get a standing ovation!